Good Shepherd Entertainment and Nyamakop’s puzzle platformer Semblance is now out on Nintendo Switch today. To celebrate, both companies have released a “squishy animated” launch trailer. Semblance is available with a special 10% launch discount from now up till July 31. Good Shepherd Entertainment has launched Semblance, the new, world-busting puzzle platformer from independent South African developer Nyamakop. The game is available today for $9.99 on Nintendo Switch™ through the Nintendo eShop, as well as Windows PC and Mac via Steam and GOG.com, with a special 10% launch discount on all platforms from now through July 31. 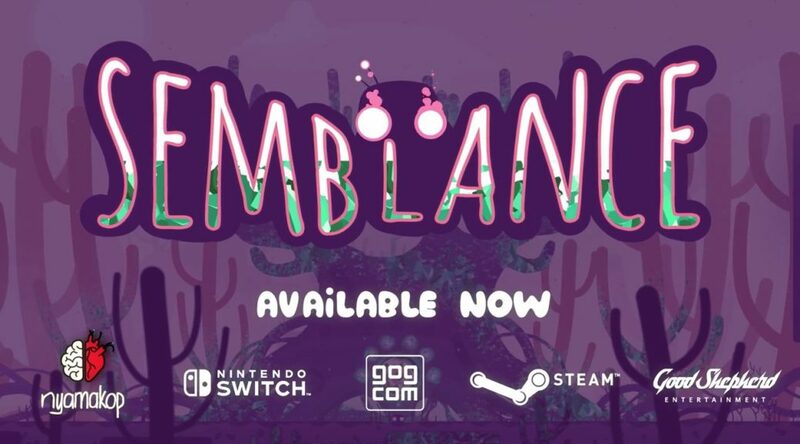 Semblance is an innovative puzzle platformer where nearly everything, including your soft, bouncy character and the environment around you, is entirely deformable! Squish, squash, mold and deform in imaginative ways to solve problems, grab hard-to-reach collectibles and heal the land from an infestation of hard material. Semblance lets you move between challenges at your pace, with an engaging story that unravels organically as you explore. Throughout development, Semblance won multiple special honors at gaming shows for its unique design and aesthetic. The game bubbles with beautiful colors, minimalist artwork, charming critters and a soothing atmosphere.